The recent discoveries of medieval wall paintings at Llancarfan in the Vale of Glamorgan have produced excitement on an international scale. Strangely, the church has no medieval monuments, not even a humble cross slab: but it does have a post-medieval stone of considerable interest. It sits just inside the south door, which is the main entrance into the church. Llancarfan’s church is almost always open, though it’s as well to check before making a visit. Cleaning and conservation of the wall paintings is continuing, and when work is in progress the church has to be closed to visitors. If medieval cross slabs are the unsung heroes of the commemorative industry, post-medieval cross slabs are the unknown warriors. Along with requests for prayer for the souls of the dead, religious iconography was supposed to disappear from monuments after the Reformation. 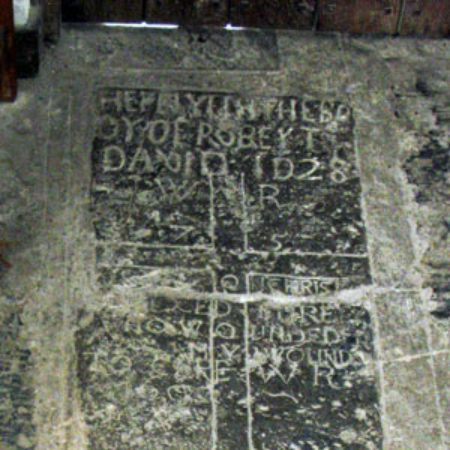 In spite of this, the churches of south-east Wales have any number of late sixteenth- and seventeenth-century cross slabs. Some, like the one described in July 2014’s Monument of the Month, are elaborate baroque designs with floriated or interlaced heads. In the Vale of Glamorgan, though, the standard design is much simpler, a plain four-line cross on a stepped base. The earliest surviving example of this design, at Llantwit Major, is dated 1534.
and a final date which looks like 169… (the last number I cannot decipher). Thomas Urquhart died in 1633. So the poem predates Charles’s stay at Carisbrooke – but he could have come across it somewhere and felt that it expressed his own feelings in captivity. Wales was predominantly Royalist in the Civil War, and conservative in sympathies after the Restoration. Whether WR (whoever he was – or whoever she was, for that matter) knew about the poem’s connection with Charles I we will never know. You find the same ideas in Welsh hymns. The great William Williams Pantycelyn, writer of ‘Guide me, O thou Great Redeemer’, had a wonderful image of making his nest in the wounds. So our two seventeenth-century inhabitants of Llancarfan were well in the main stream with their poem. We know nothing else about them, or why they are commemorated by the same stone. It is just possible in spite of the long time between them that ‘W R’ was Robert David’s son and had taken his father’s Christian name as his surname. In the seventeenth century Welsh people were just moving over from the old patronymic form of names (William ap Robert ap David …) to the English style of surnames. But there is a crossover period during which their names look like surnames but change with each generation – so David Edwards’s son could be Robert David, Robert David’s son could be William Robert, and so on. They were probably yeoman farmers somewhere in the parish. Llancarfan had no resident great landowners: much of the land in the parish belonged either to the diocese of Gloucester or to Jesus College, Oxford. It was the lack of money in the parish which enabled the wall paintings to survive under their coats of lime wash: there was no-one with the money to ‘restore’ the church in Victorian Gothic style. The same lack of local money may explain the paucity of memorials in the church, but it has left us with this one intriguing reminder of the very complex local responses to the Reformation and subsequent religious change.